Back when the daily arrival of a newspaper was commonplace, the comics section was one of the most popular. Headline, sports, funny-pages. That’s when people would actually start reading. 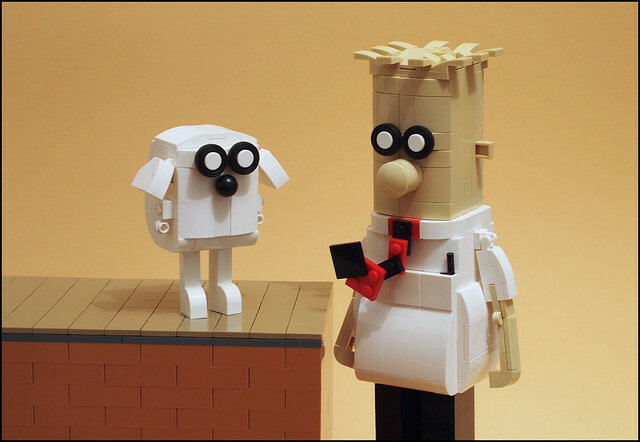 And in 1989, Dilbert and the megalomaniacal Dogbert arrived on the scene. The sarcasm surrounding office politics, micromanagement, and new technology really struck a chord. As did these guys when I saw them, by builder grubaluk. I wonder what kind of scheme Dogbert is hatching today?